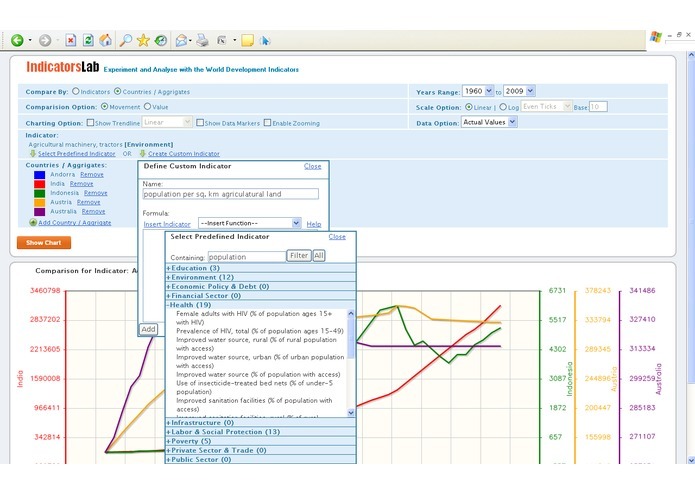 Indicators Lab is an online application to analyze the various World Development Indicators and experiment with them. You can compare various indicators for a country or various countries for an indicator. For a country, with movement comparison option, you can compare the movement or trend of multiple indicators. This can help to study the effect of indicators on each others. Each indicator is displayed on separate vertical axis of the chart. The highlight of the application is "Custom Indicators". Yes, you can define/derive your own indicators or indices by combining multiple predefined indicators together with mathematical operations. Custom Indicators can be defined using various mathematical, trigonometric and conditional functions. This makes the application capable of analyzing the world development indicators with various combinations and calculations. Even the ranks of the countries for the specific countries over the selected range of the years can be obtained and displayed on the chart. Optionally you can have logarithmic scale with even or power tick distribution with a user definable base. Optionally you can display trend line, data marker on the chart and enable chart zooming. The data for the chart can be downloaded in CSV format.